Week 7 is over and it's very close at the top of both divisions! 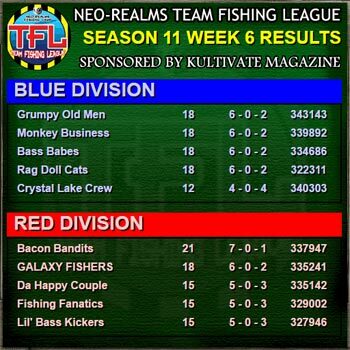 In Blue Division: Monkey Business, Grumpy Old Men and Rag Doll Cats share the top points, and in Red Division Galaxy Fishers and Bacon Bandits are on top. Only 3 more weeks before the top 2 of each division enter the playoffs! Week 6 is over, and there is still a 4-way tie in Blue Division! In Red Division, Bacon Bandits and Galaxy Fishers are alone in the 1st and 2nd spots, while there is a 5-way tie for the 3rd and 4th slots! Still very close! Good luck to all teams this week! We are halfway through the regular season! 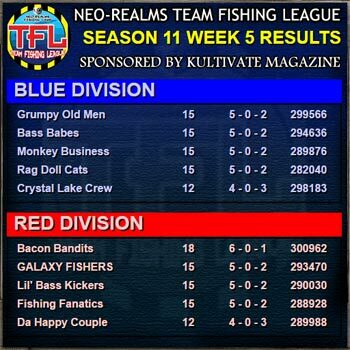 In Blue Division it remains extremely close with Grumpy Old Men still on top. In Red Division: Bacon Bandits claim first place for themselves. Good luck to all teams for Week 6! 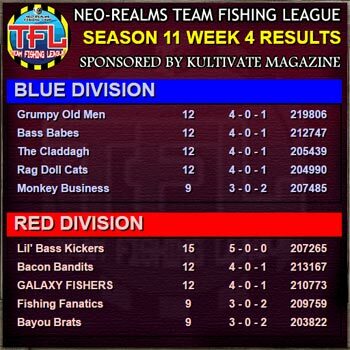 Week 4 is over and Lil' Bass Kickers has edged a one game lead in Red Division. Meanwhile in Blue Division it remains close with a 4-way tie with Grumpy Old Men on top in tiebreaking points. Good luck next week! Week 3 is complete! 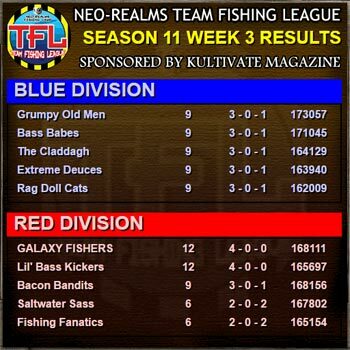 In Red Division: Galaxy Fishers and Lil Bass Kickers remain undefeated, while in Blue Division there is a five-way tie for first, with Grumpy Old Men on top with tiebreaker points. Good luck to all teams this week!